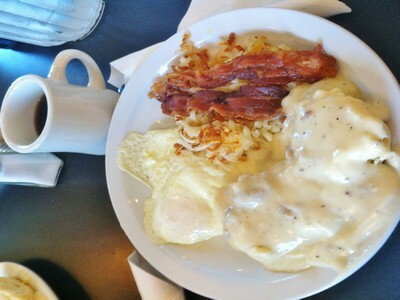 Don’t go to Napa Valley just for the wine, go for the food! Napa has been attracting top chefs from all over the world because of its ideal location for the freshest ingredients – all locally grown, organic and sustainably produced.Napa is now deemed a gourmet destination on par with its’ world-class wines with an abundance of farm-to-table restaurants. For a true, ingredient-driven, farm-to-table menu like no other, you simply must visit Long Meadow Ranch’s Farmstead Restaurant. Farmstead’s menu is crafted around seasonal, locally grown, organic ingredients at the peak of freshness. Many are harvested right there at Long Meadow Ranch, including all-natural grass-fed beef, vegetables, extra virgin olive oil, and honey. Executive Chef Stephen Barber has a long history of Southern cooking styles, most evident in many of the wood-roasted dishes. I’m a huge fan of anything blackened, and absolutely love the flavor it brought out in everything we tried from peppers to pork chops and peaches. Our server was extremely helpful in suggesting seasonal menu items that would be sure to make our mouths water. We started off with a small plate of wood-roasted Pardon peppers. These mild, little peppers originate from Spain and are at their peak June-September. Served hot off the fire and tender, they were tangy and sweet mixed with a deep smoky flavor, sprinkled with salt and a drizzle of olive oil. 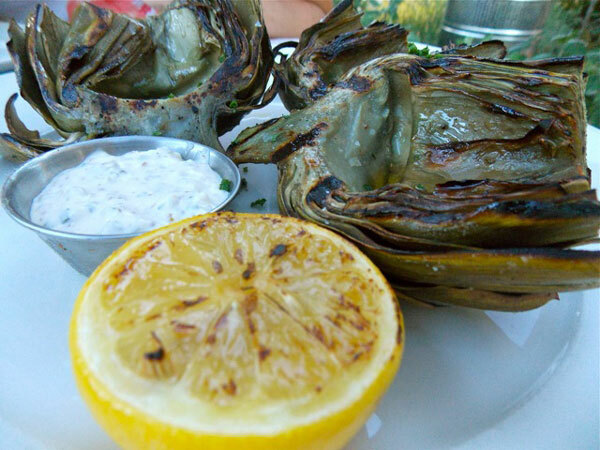 We couldn’t pass up the wood-grilled, Castroville jumbo artichoke, served with sauce gribiche and lemon. I don’t think I’ve ever had a more tender artichoke. Every leaf was soft, fleshy and melted in my mouth. Just like the peppers, I loved the smoky flavor blackening added. 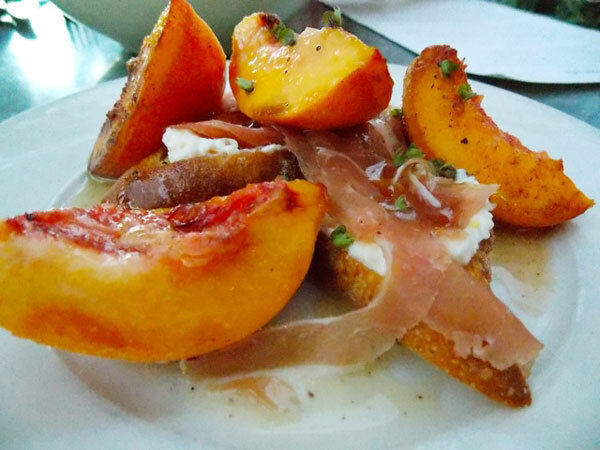 Peaches were in season, so we had to order the grilled Frog’s Leap peaches and speck (juniper-flavored ham) on bruschetta with fresh-made ricotta and basil – Heaven! Seriously, I could hear harps playing as the peach juices burst in my mouth. The pairing of sweet and soft with the crunch of the bruschetta and tanginess of ham was genius. I could’ve eaten nothing but these three first courses and walked away a happy woman. But, we were only just getting started. Staying on theme, I chose the wood-grilled Heritage pork chop with green beans, jalapeno grits, and Frog’s Leap peaches (just couldn’t get enough of them). My pork chop was cooked to perfection, juicy and flavorful without a hint of dryness to it. How do they do that? I knew I couldn’t go wrong with the peaches and jalapeno grits, and I was right. My green beans were a little undercooked, but that would be the only criticism of the night. Even my dining companion’s grilled California rainbow trout with wild mushrooms, fennel, toasted almonds and a warm bacon vinigarette was divine. You know there is always room for dessert. Can you guess what we ordered? Yep. More peaches! Served in a crumble with vanilla bean ice cream, it was the perfect comfort food to end an evening of delicious farm ambience. And not a bite was left between the two of us. Our meal was complemented with a delicious red wine made there at Long Meadows Ranch making it truly a complete farm-to-table experience. The rustic charm and ambience of the restaurant extends beyond the indoor dining area to the outside where you can dine among the espalier apple trees during the warmer months. Parents can enjoy the outdoor bar while the kids play horseshoes on the large lawn or run around the sensory garden. Monday nights are set aside especially for families, with a fixed three-course meal specially priced for just $29. Kids can order from their every day kids menu which includes kid favorites like burgers and mac and cheese. If and when we return to Napa, we will return to Farmstead. It was just that good. 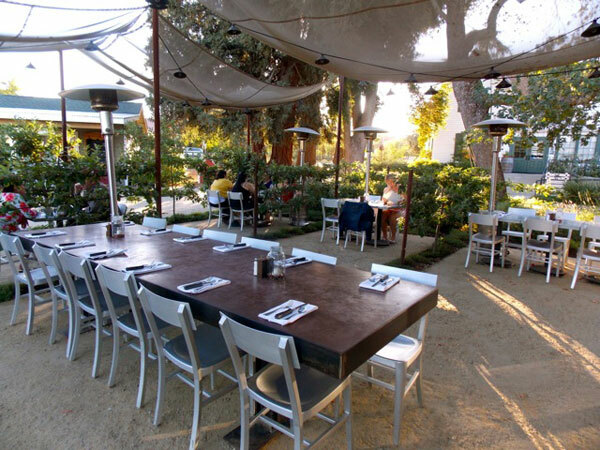 Disclosure: Farmstead Restaurant hosted me for the purposes of writing this review. No other compensation was provided. All opinions expressed are my own and without influence by Farmstead Restaurant. Previous Post: « Summer Lasts 60 Days Longer in Myrtle Beach!